In the past five decades First Alert has pushed the Envelope in product innovations. And while we've ventured successfully into an ever-expanding home safety market, we've always stayed true to our roots and our flagship brand, harnessing technology to build the most reliable fire safety products for the people who put their trust - and their lives - In our hands. 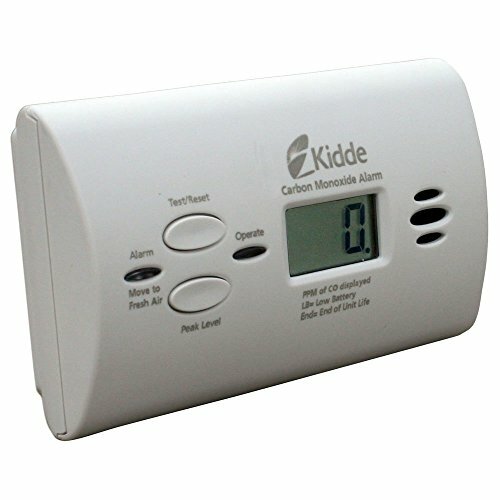 Kidde 9CO5-LP With the use of sophisticated electronic components, the Kidde 9CO5-LP battery-operated carbon monoxide alarm protects you and your family from the dangers of carbon monoxide. Also included is an intuitive slide-out battery door that gives easy and immediate access to the batteries and a safety feature mechanism that makes the unit difficult to close without the proper installation of the batteries. This easy-to-install alarm is appropriate for all living areas and comes with a 7-year life warranty and 5-year limited warranty. 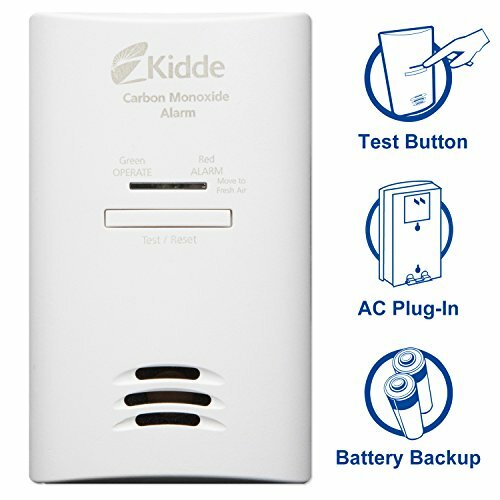 Consumer Benefits The Kidde 9CO5-LP will alert you and your family with a loud warning signal against the dangers of elevated carbon monoxide levels in your home. This battery-operated carbon monoxide alarm continuously monitors carbon monoxide levels, even during power outages when AC-only units are not providing protection. Technical Specifications This unit uses an electrochemical sensor, and when it detects carbon monoxide, it will alert the user with a distinct pattern. The alarm pattern is four short beeps, followed by five seconds of silence, then four more short beeps with a corresponding red LED light. This cycle will continue for four minutes and then change to one cycle every minute until the device is reset or the carbon monoxide is eliminated. In addition, the red LED light will pulse to indicate carbon monoxide has been detected until the device is reset or carbon monoxide is removed from the surrounding area. When there is no carbon monoxide present, a green LED light will flash every 30 seconds, indicating a properly operating alarm when power is present. What's in the Box One Kidde 9CO5-LP unit and two AA batteries. Slide-out battery door that gives immediate access to the batteries and a safety feature that makes it difficult to close the door without the batteries being installed. Inside cover of battery door features quick reference guide for what to do in case of an alarm. Provides continuous monitoring of CO levels, even during power outages when AC- only units are not providing protection. 10-year life and a 10-year limited warranty. 10-Year Life: If your CO alarm was manufactured prior to 2013, it does not have a 10 year life. Consult your User Guide for additional details. Warranty: 10-Year warranty: Consult User Guide for more information. The nighthawk, AC powered, basic plug in carbon monoxide alarm, with battery back up, easy to install, provides reliable protection against the dangers of carbon monoxide, written information & instruction, easy for anyone to understand, AC/dc digital alarm has a small sleek design that is suitable for all living areas, 7 year limited warranty. This product adds a great value. Product is highly durable and very easy to use. This product is manufactured in china. 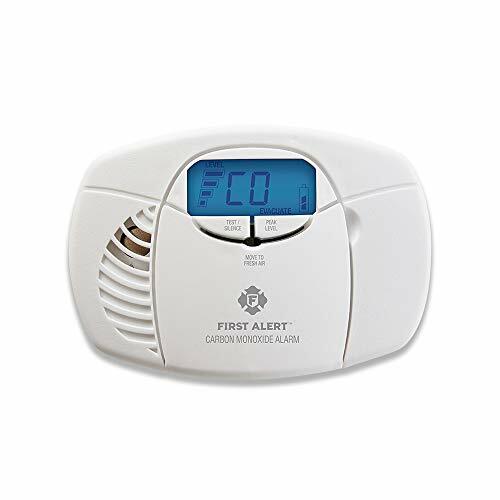 The First Alert CO400 Carbon Monoxide Alarm utilizes an electrochemical carbon monoxide sensor to monitor your space for a carbon monoxide threat. The battery-powered design doesn't require an electrician; simply insert the included 9-volt battery, and the carbon monoxide detector is ready to go. The advanced electrochemical CO sensor detects carbon monoxide leaks from multiple sources, such as faulty fuel-burning appliances, blocked chimneys, and generators running inside or too close to homes. When CO levels become elevated, a loud 85-decibel alarm alerts you to the threat. Because CO evenly distributes itself, it's important to have a CO detector on every level and in every bedroom of your home. 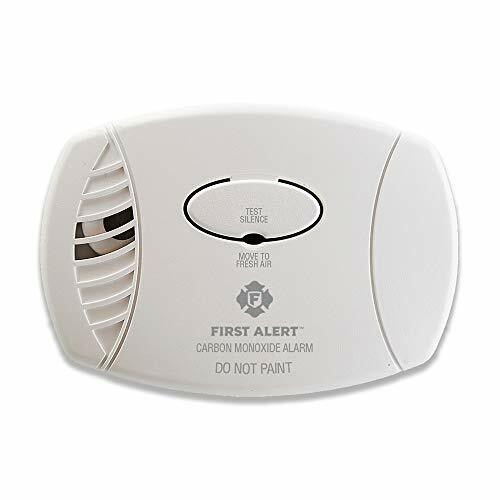 Designed to be simple to use, the CO detector has just one button that silences or tests the unit, as well as an end-of-life timer that lets you know when it's time to replace the device. 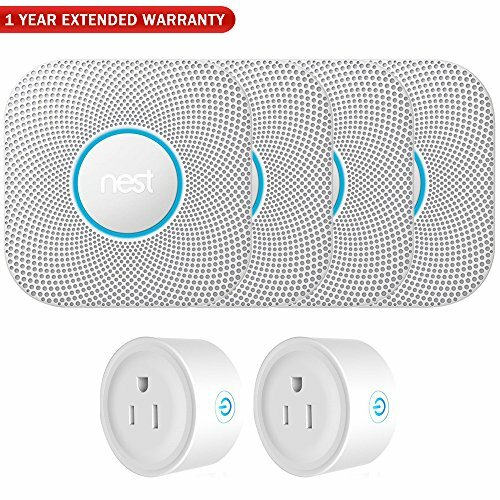 The First Alert CO600 Plug-In Carbon Monoxide Detector helps protect your family with an electrochemical sensor, and easily plugs into any standard outlet with no additional mounting necessary. It features an 85-decibel alarm that sounds when CO is elevated. One button silences any nuisance alarms, and also tests detector functions. And an end-of-life signal enhances your safety by letting you know when it's time to replace the unit. Keep your family safer by installing units on multiple levels and in each bedroom. The nighthawk, dc battery operated carbon monoxide alarm, easy to install unit that provides reliable protection against the dangers of carbon monoxide, written information & instruction, easy for anyone to understand, small, sleek design that is suitable for all living areas & has a 7 year limited warranty. This product adds a great value. Product is highly durable and very easy to use. This product is manufactured in china. 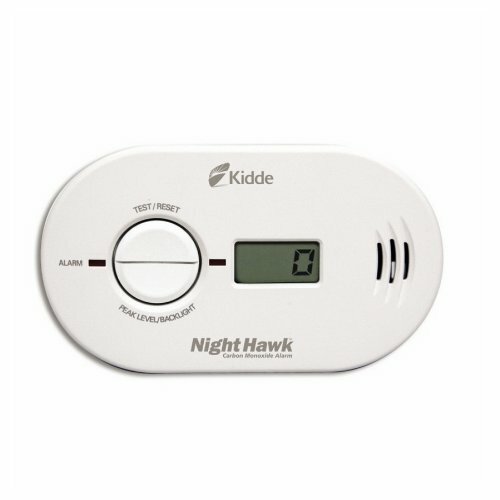 Easy to install and monitor, the Kidde Nighthawk KN-COPP-B-LP battery-operated carbon monoxide alarm with digital display provides reliable protection against the dangers of carbon monoxide. Its backlit digital display shows the current carbon monoxide (CO) level at a glance, and it displays every 15 seconds. 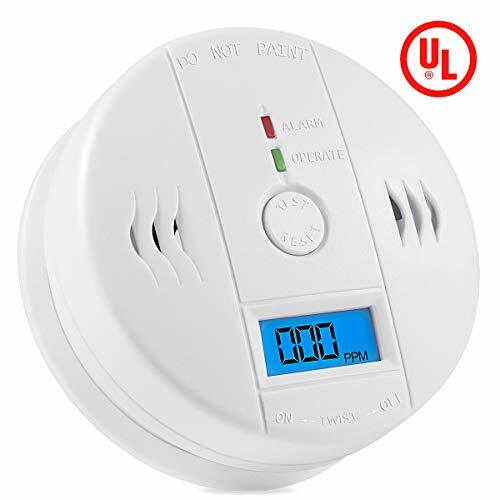 With an increasing number of state and local governments passing legislation requiring CO detectors in homes, it's never been a better time to safeguard your family against carbon monoxide exposure. Battery-powered protection against the dangers of carbon monoxide (view larger). Backlit digital display for easy monitoring at all hours (view larger). KN-COPP-B-LP Battery-Powered Carbon Monoxide Alarm with Digital Display At a Glance: Battery operated, powered by 3 AAs (included) Backlit digital display updates with CO level every 15 seconds Peak level memory displays highest CO concentration since last reset Test/reset button to ensure proper operation Loud 85 dB alert when deadly CO gas is present Seven-year limited warranty Features Offering a small, sleek design that's suitable for all living areas, the Nighthawk KN-COPP-B-LP provides you and your family with a loud warning signal against the dangers of elevated carbon monoxide levels. You'll get continuous monitoring of CO levels, even during power outages when AC-only units are not providing protection. The digital display adds an advanced level of protection, showing CO levels in PPM (parts per million) and allowing you to see if levels change. The backlighting helps you read the display in the dark, and it also appears during the peak level cycle. The unit also has a peak level memory, which displays the highest CO concentration measured since the last reset. It features two color LEDs for at-a-glance status updates. The green LED flashes once every 30 seconds to indicate the alarm is working properly. A red LED will pulse to indicate that carbon monoxide has been detected. 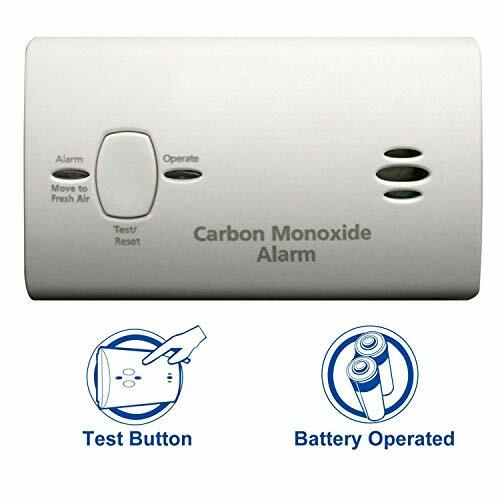 When the unit detects carbon monoxide, the alarm sounds four short beeps (rated at 85 decibels at 10 feet), followed by five seconds of silence, and then followed by another set of four short beeps. The unit measures 3 inches by 5 inches by 1.5 inches. The KN-COPP-B-LP includes multiple mounting options, allowing installation on a wall or a tabletop. It has a seven-year operating life (with matching seven-year limited warranty), providing 40 percent longer protection than other CO alarms. It's powered by 3 AA batteries (included). What's in the Box One Kidde Nighthawk KN-COPP-B-LP battery-operated carbon monoxide, three AA batteries, and operating instructions. 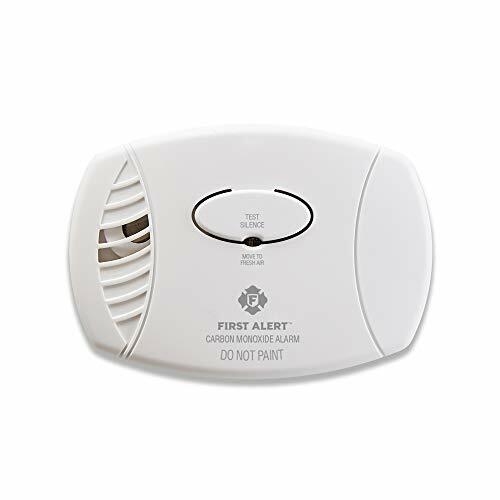 The First Alert CO410 Carbon Monoxide Alarm uses an electrochemical carbon monoxide sensor. Peak Level feature displays the highest concentration of carbon monoxide measured. When Carbon Monoxide levels become elevated, a loud 85-decibel alarm alerts you to the threat. Designed to be simple to use, the Carbon Monoxide detector has just one button that silences or tests the unit. Because CO evenly distributes itself, it's important to have a CO detector on every level and in every bedroom of your home. This easy-to-use battery-powered design doesn't require an electrician; simply insert the included AA batteries, and the carbon monoxide detector is ready to go. 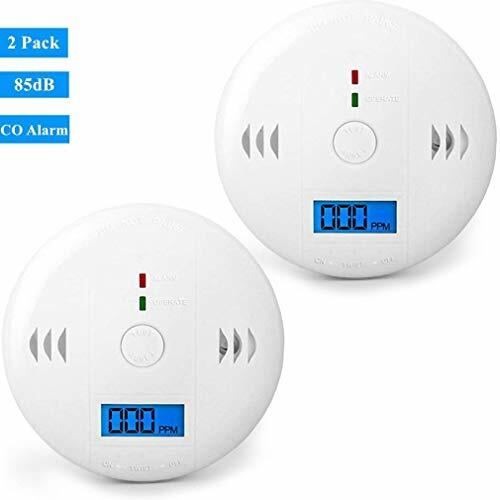 This product is a smart carbon monoxide detector with voice prompt, microprocessor control, support displaying of the carbon monoxide gas concentration and the time. When trigger the gas detector. This detector adopt catalytic combustion method sensor which is stable and reliable. It keeps the place safe from the threats of carbon monoxide gas. This product can be well used in villas, factories, shopping malls, warehouses, office buildings etc. indoor places. 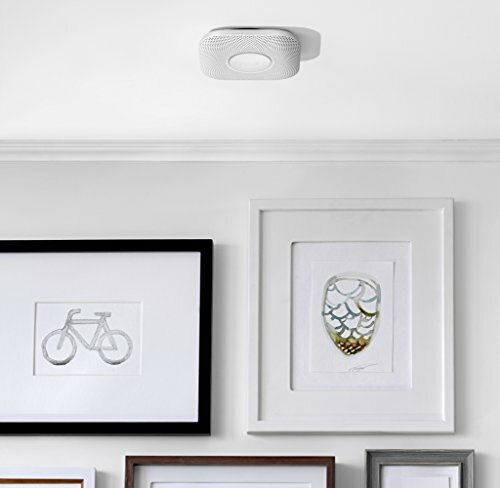 Sleep tight at night knowing that your home is being watched over by the Nest Protect Smoke and Carbon Monoxide Alarm. This handy machine doubles as a smoke alarm and carbon monoxide monitor. When it needs to notify you of any concerns, it warns you in a friendly human voice while also sending messages to your phone app. That way, you'll know exactly where the trouble is when it's happening. Plus if it makes any errors, you can just silence it with a tap to your screen. Your family and your home are what's important to you, so keep them protected at all times with a Nest alarm. 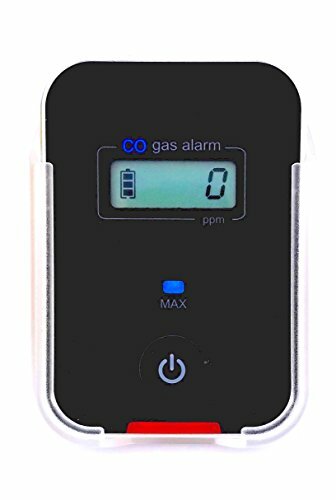 The original "FORENSICS" vehicle & aircraft CO gas detector made with the BEST high quality Japanese sensor technology for MAX protection at low-level 9ppm alarming. 2018 stylish design, strong aluminum with stylish metal finish. Early alarming to prevent CO exposure from exhaust leaks and/or outdoor polluted air entering the vehicle/cabin that commonly triggers headaches, nausea and fatigue. Have peace of mind and take preventative care. The FORENSICS CO detector was specifically designed with "reliability and ease of use" for POLICE, Ford Explorer Owners (NHTSA Investigation "Ford Explorer Exhaust Odor"), emergency vehicles, aircraft pilots, truck drivers, UBER, fleet vehicles, personal vehicle operation and personal protection for travel. CO alarms are set at 9ppm with RED LED & 25ppm with audible buzzer sound (70dB). To ensure max protection, 9ppm alarm level were chosen as recommended by the World Health Organization (WHO), Environmental Protection Agency (EPA), American Society of Heating, Refrigerating and Air-Conditioning Engineers (ASHRAE) and American Conference of Governmental Industrial Hygienists (ACGIH). 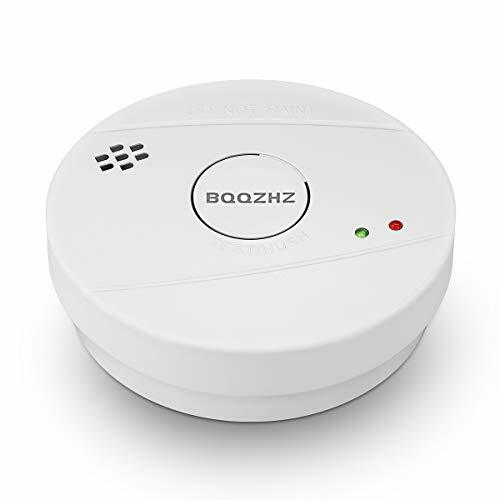 The CO vehicle, aircraft travel alarm includes smart detection algorithms designed in California USA, a high quality sensor Made in Japan and Product Manufactured in China. Small, modern aluminum alloy body give a real "metal finish" high quality touch, lightweight (2oz) and comes with a robust case and a 3M stick-on mount option. Regular home CO alarms are too slow, alarming in 60 to 240 minutes only when over 70ppm - way too high as fatigue and drowsiness will be incurred leading to accidents. The FORENSICS CO detector has been tested and confirmed at altitude for aircraft reliability. One-button operation making it easy for anybody to operate. Box includes CO detector with 2xCR2032 batteries installed, plastic sleeve mount and clear instructions in English. 100% customer satisfaction guaranteed. Test and verified in California, USA.  USES: Exhaust leaks in vehicles (i.e. Ford Explorer ), aircraft, school buses, trucks & fleet vehicles that triggers headaches, nausea & driver fatigue. ACCURATE: CO low-level alarm at 9ppm & 25ppm alarms WHO, EPA, ASHRAE, OSHA, NIOSH CO recommended exposure levels.  FAST ALARMS: Alarms at >9ppm @ 60 secs, compared to home CO detectors that only alarm >70ppm @ 60-240 minutes. Bright RED LED and buzzer alarms.  EASY USE: Continuous 12 month operation with same batteries. Easy one button operation. Small form factor (2oz), 3M stick-on mount. The 3-pack of First Alert CO600 Plug-In Carbon Monoxide Detector helps protect your family in multiple rooms. The alarms feature an 85-decibel alarm and an electrochemical sensor, and easily plug into any standard outlet with no additional mounting necessary. One button silences any nuisance alarms, and also tests detector functions. And an end-of-life signal enhances your safety by letting you know when it's time to replace the unit. Keep your family safer by installing units on multiple levels and in each bedroom. Step 2: the unit will sound 4 beeps every 5s twice & Red LED flashes & LCD display "000" (3 min), that shows the unit in a normal situation. Carbon Monoxide Alarm alerts you to dangerous carbon monoxide,even in the event of a power outage. 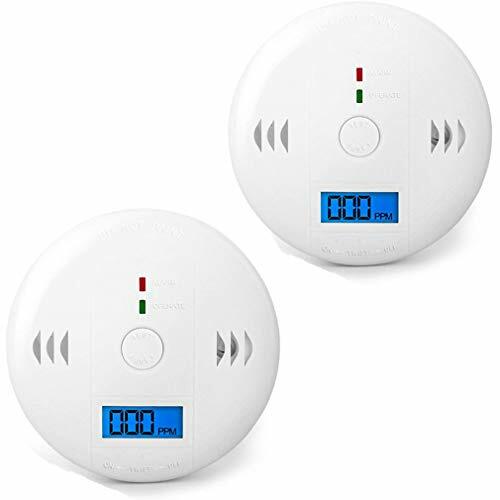 This carbon monoxide detector features a digital display that shows the carbon monoxide level in the room, as well as the unit's power level. If you leave home for long time, if the unit was alarm in this period, you just press the button for several seconds, the green light will flashes once every seconds ans the LCD will display the actual concentration. 1.Don't press test/reset button while installing batteries. Otherwise, the unit will not work. 2. The unit needs to be tested weekly. Verify the alarm and LED light operation by test the unit once a week. ALARM STANDARD - 50ppm, alert within 60 to 90 minutes; 100ppm, alert within 10 to 40 minutes; 300ppm, alert within 3 minutes. Note: When you test the detector, please do not use gas blow the hole directly. 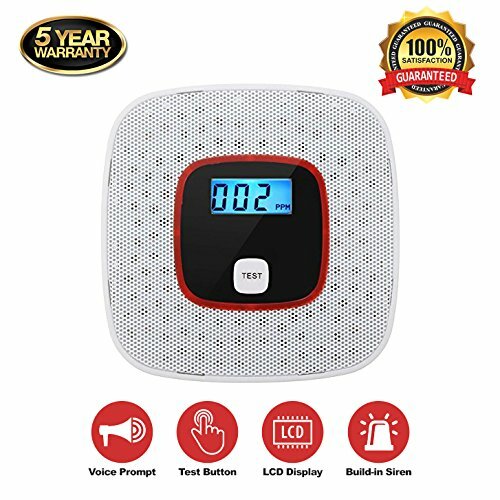 AUDIABLE 85 dB ALARM WARNING - When a Dangerous level of Carbon Monoxide is detected, the Red LED will flash and a loud alarm pattern will sound, Loud 85 decibel alarm with LED Flash While in the Alarm Mode for the Life-Saving Safety. UNIQUE DESIGN - Portable and easy installation. Precise Electrochemical sensor, high consistency and stability, move, or in the same place for that. Loud enough and sounds good. SAFETY AND VISIBLE- Protect the Family from Carbon Monoxide, With 3 digits LCD Dis-player is Optional, 'Err' on the LCD to indicate the unit is malfunctioning. 'Lb' on the LCS to indicate it low battery and need to replacement. '999ppm' on the LCD to indicate CO level over 999ppm. If the Co leakage is less than 999p. ENERGY-SAVING - Operated by 3 x 1.5V AA Batteries (not included), The alarm sound pattern is 4 beeps every 5seconds for the first 4 minutes. In 4 minutes, it will change to 4 beeps ever minute to save the battery. Instant Saving Of $40 If Each Detector Was Purchased Individually.